For those of you keeping up with the blog, you'll remember that I made a promise a few weeks ago to try my own version of M.F.K. 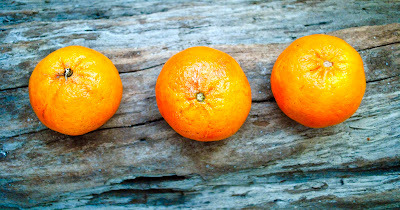 Fisher's Radiator Tangerines. If you happened to miss that particular post (shame on you), you can read the complete story here. Be sure to have a hot cup of tea nearby, it makes the experience that much better. 1. It is important to pick nice full tangerines. Heavy for their size and brightly colored. Because they are more often than not being flown in from various tropical regions, they will be best while the Northern Hemisphere is having it's winter. 2. Peel the tangerines. You'll need to be sure to remove as much of the spongy white pith as possible, as it will make the end result chewy, not crispy. It may be necessary to take a paring knife to scrape the remaining pith from the sides of the fruit. Take your time. The very last thing you want to do is break the skin holding all the segment's juices. 3. Begin to separate the segments. Remove as many of the strings from the inside as you can. Eat a few pieces - for two reasons: (1) Because they're good and cooking is (and should be) enjoyable, and (2) It is important that you have an initial memory of what a fresh tangerine tastes like, to base your future roasted tangerines off of. 4. Line the bottom of a heavy cast iron pan with clean (never used) hay. I sourced mine from a local farmer. Most will give you a little for free (with a strange look or two thrown in complementary). It is incredibly important to be sure the hay has not been treated or coated with any pesticides, paints, or lacquers (I know this sounds weird, but many craft shops do this to make plain hay look "pretty") Just be careful. 5. Preheat the oven to 250 degrees F. Lay out the pieces of tangerine on the base layer of hay. 6. Place another layer of hay on top of the segments. Be sure the hay is contained within the cast iron and not sticking out in any strange directions. Into the oven goes the entire set up, uncovered, on the middle rack. Take a good look into the oven and make sure there isn't any hay touching the heating elements. Allow the fruit to roast for three to four hours. Don't be afraid to peek on them from time to time and even taste a few, just to see how the flavors and textures are developing. 7. When you believe they are done, carefully remove your cast iron from the oven and set it on a thick towel. Remove the top layer of hay and set your segments on a clean plate to cool slightly, just a few minutes. You'll definitely want to eat these warm. The resulting tangerines were beautiful, and more complex than I could have ever imagined. Their skins cracked sharply beneath my teeth like a thin layer of bruleed sugar. Giving way to the warm juicy pulp. The fruit had taken on a very earthy tone (most likely due to the hay). Flavors of cinnamon, honey, and toasted oats were very prominent. Also, most of the acid had subsided and a jamy cooked orange marmalade flavor had taken over. The juice within the fruit had concentrated as well, so it was like tasting an orange on steroids - really intense, and sweet. My personal thoughts: LOVED the flavor, but I'm on the fence about the texture. It was just a little too difficult to get through the skin for my liking. 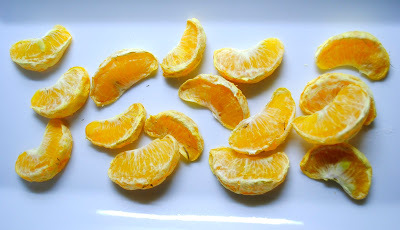 I think the best use of this technique lies in what is done with the segments after they are roasted. Maybe squashed and made into a jamy marmalade? Juiced and made into a smooth refined sauce? They would make a rockin' ice cream. Take your pick. One thing is for sure, the wait is well worth it. I don't know of another method to achieve quite the same strange (yet familiar) flavor. If anyone knows of it, please be sure to let me know. ...there is a different and maybe even better way you could be doing it.